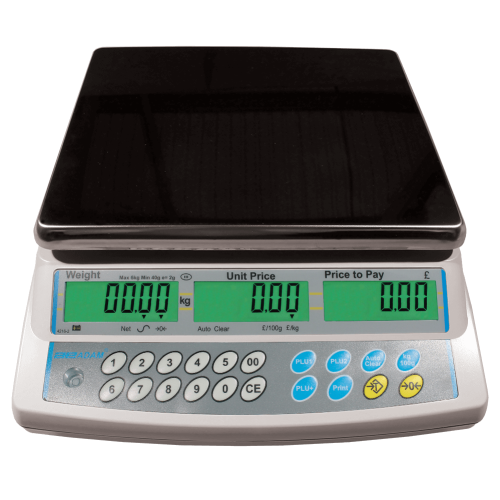 Durable and easy to clean, AZextra price computing scales provide an all-around excellent value product for supermarkets, butcher's shops and general retail and cost calculation tasks. AZextra displays weight, unit price and total price on front and back panels simultaneously. This allows both the scale operator and purchaser to view information and verify quantity and pricing, boosting customer satisfaction. The AZextra is a trade approved scale often used alongside an optimal weighing scoop attachment for weighing loose candies and sweets. Once a bag of sweets has been filled, it can then be sold by weight to customers. Supermarkets often require price computing scales with the necessary trade approvals for selling products such as fruit, vegetables, meat and cheese by weight. The AZextra has a PLU (price look-ups) total of 103 for quickly selecting the most popular items. Butcher's shops and fishmongers sell joints, fish products and slices of meat by weight, it is essential that a trade approved scale is used to ensure that the scale is correctly configured and the customer is being charged the correct amount. The AZextra is fully trade approved in line with NMI requirements. With harvest season fast approaching, farmers need to ensure that they have all the necessary equipment ready for quick product turnaround and distribution.